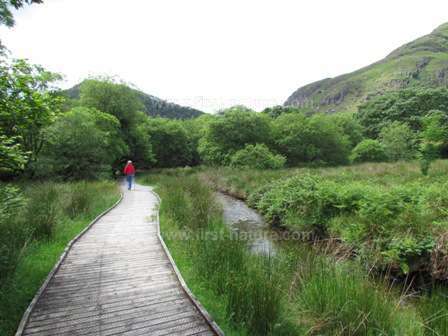 Gwenffrwd Dinas RSPB Reserve, often referred to simply as Dinas, is in one of the most beautiful parts of Wales. From whichever direction you approach this special place you will enjoy a trip through beautiful scenery regardless of the season. The Reserve is in the heart of the Elenydd Special Area of Conservation which is protected for both it's precious habitats as well as the wealth of wildlife that depend upon them for their survival. The birdlife in the area is rich, but so is the plantlife which includes numerous uncommon species. In turn, the plants support many insect species: butterflies, moths, Dragonflies and Damselflies to name but a few. Take the unmarked road from Landovery signed towards Rhandirmyn and continue along this road following signs for Llyn Brianne Reservoir. About 10 miles from Llandovery you will see the entrance to Gwenffrwd Dinas on the left hand side of the road. There is a car park for which the RSPB request you should donate £1 to help with upkeep of this remote site. Entrance to the reserve is free of charge and it is open all year round. 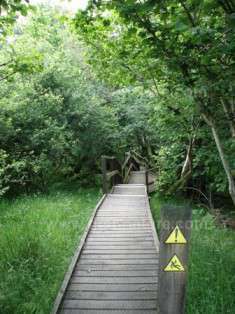 There is an excellent boardwalk, directly accessible from the car park, leading through the streamside woodlands. There is also another nature trail of around 2 miles but parts of it are rocky and slippery and not suitable for wheelchairs or prams. Stout footwear is recommended for a visit to this site at all times of the year. There is a toilet at the reserve and also some information boards. Cafes, shops and other facilities are all available in Llandovery and the surrounding villages. By following the boardwalk from the car park you will walk through a delightful woodland area beside a busy stream which is source of food for Dippers (Cinclus cinclus), Common Sandpipers (Actitus hypoleucos) and Grey Wagtails (Motacilla cinerea). Spring is the time to see and hear Cuckoos and other summer visitors such as Redstarts (Phoenicurus phoenicurus) and Pied Flycatchers (Ficedula hypoleuca), but this area is home to Red Kites (Milvus milvus), Buzzards (Buteo buteo) and Peregrine Falcons (Falco peregrinus) all year round. The wealth of flowers encourages many species of butterflies. Good ones to look out for are Common Blue (Polymmatus icarus), Speckled Wood (Parage aegeria), Red Admiral (Vanessa atlanta), Orange-tip (Anthocharis cardamines), Comma (Polygonia c-album), Peacock (Inachis io) and Small Copper (Lycaena phlaeas) among others. The reserve is also home to several Dragonfly and Damselfly species including Gold-ringed Dragonfly (Cordulegaster boltonii) and the Common Hawker (Aeshna juncea). This is a delightul nature reserve which has something of interest for everybody.